One of the biggest challenges of rustic living is finding alternatives to modern building designs that capture the beauty of nature, and rustic handrails are ideally suited for this task. 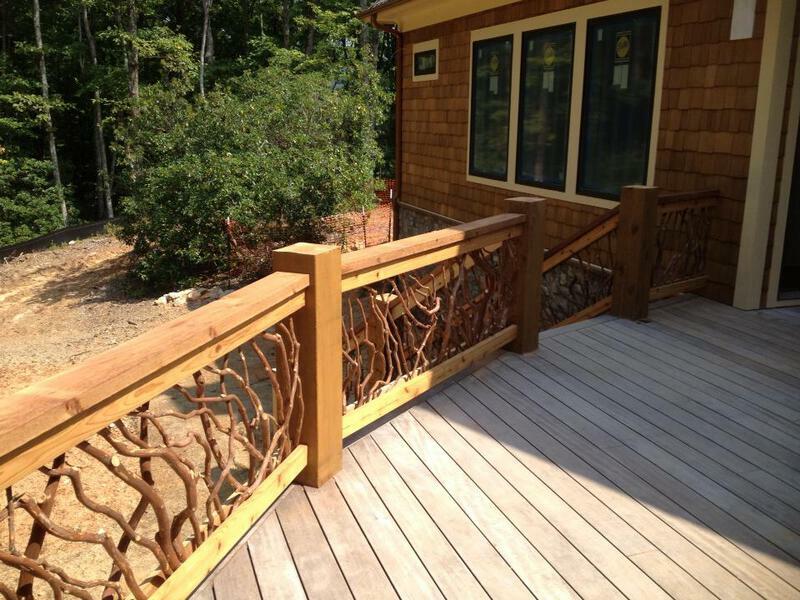 Putting average railings on your decks, stairs and landings detract from the organic look of your home or log cabin. Even more, contemporary structures can use a touch of nature to tie them into the landscape. Rustic deck railings can add just the right amount of nature to any structure but how do you find the one that has both form and function? Some homes in certain areas, like the mountains or the country, are perfect for a rustic theme. You know the type: wood and stone and earth colors — lots of log structures and timber frame porches. Some people like the rusty metal roof look, and it’s easy to recreate and still have a watertight home! 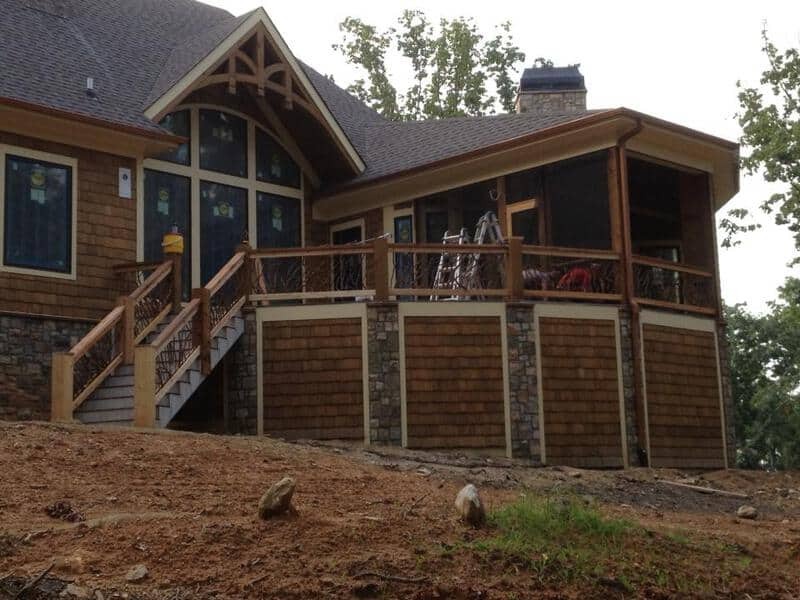 The best way to quickly and easily capture the look of a mountain lodge is with a branch railing from Mountain Laurel Handrails! This is the perfect conversation started for any backyard barbecue. Handrails, railings or guardrails all have two main parts; the top piece your hand touches, usually spanning from post to post, and the balustrade or screen that prevents children and pets from going under the railing. Log style railings typically have a balustrade of vertical sticks or balusters that form the lower barrier. 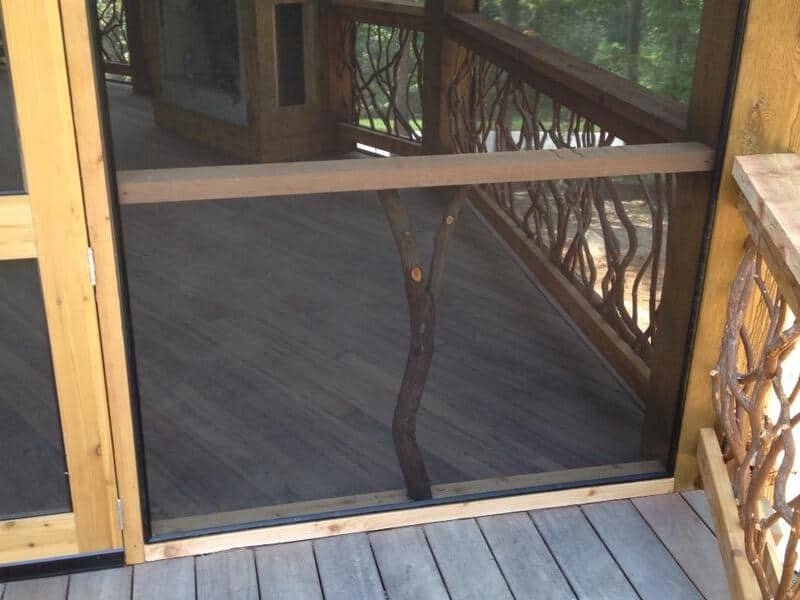 Other cabin railings may use wood, metal or glass screens to break up the monotony of vertical and horizontal lines associated with log home railings. 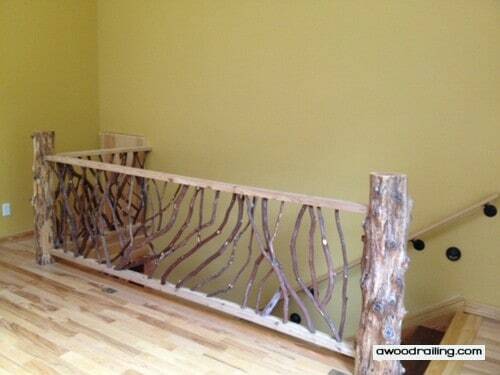 Choosing natural materials like Mountain Laurel Handrails can make a boring balustrade into a work of natural art. When it comes to rustic handrails, the frame should be naturally strong and complement the structure. As mentioned, natural railings can be an opportunity to deviate from the repetitive lines created by the structure. Those with screens made from materials like laurel are both strong and beautiful. Strength isn’t the only safety factor confronting the design though. Building codes require that the gaps in the screen or balustrade be small enough your pets and children don’t fall through. These guidelines must be met whether on the interior balcony or exterior deck of the home. Log style railings bunch the balusters together to keep the gaps small. To avoid this, rustic porch railings sometimes have screens constructed from limbs layered to represent the forest canopy. While this is less repetitive, the limbs of most trees are too weak to form a secure barrier. 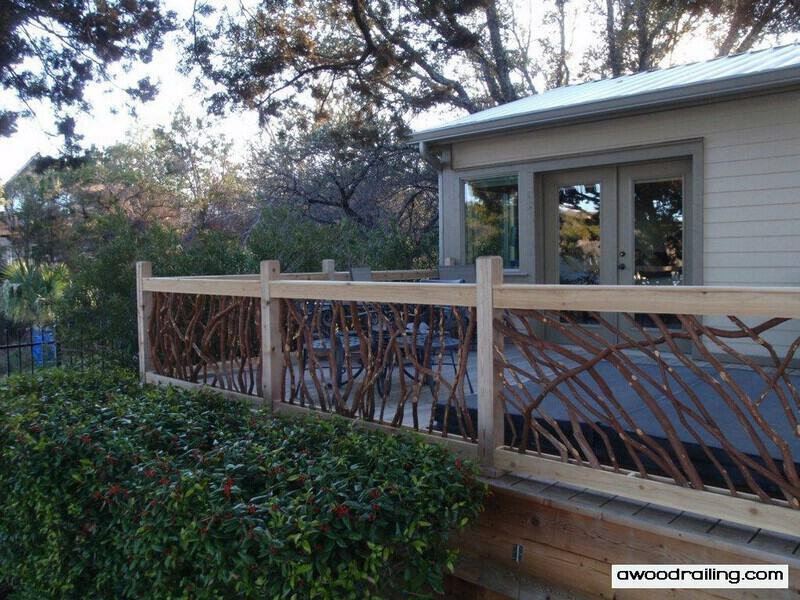 Handrail screens made from mountain laurel maintain the canopy illusion while forming a strong, safe barrier. When choosing any product for your home, there are always many options. A common sight on log homes is the turned log baluster. This is commonly a pine, or sometimes a white cedar, turned round about 3 inches to 4″ diameter. They are often connected to round top and bottom horizontal rails with a mortise and tenon joint. (This is an advanced woodworking technique where two pieces of wood are joined by fitting the end of one into a hole on the other.) The top and bottom rails are also often round logs but are usually a larger diameter. 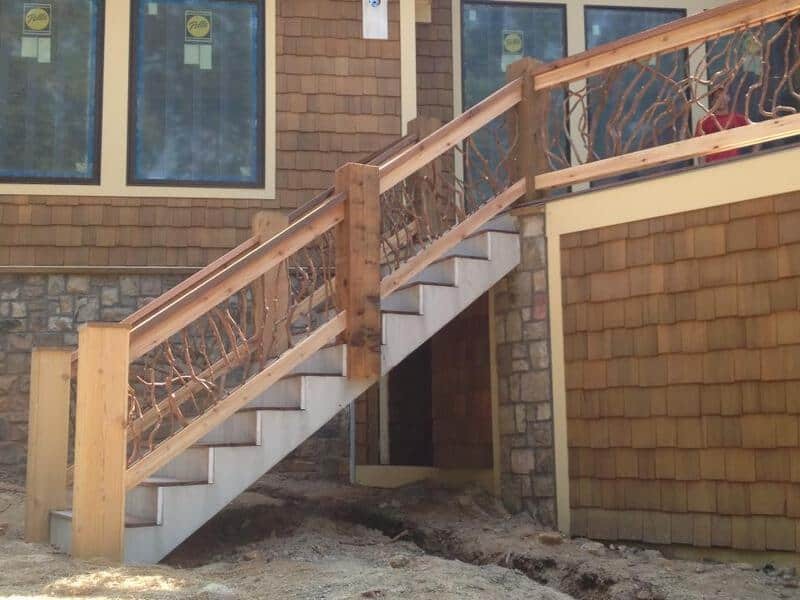 Mountain Laurel Handrails provides the best rustic rails in easy to install sections, delivered nationwide. The sections pictured here are built offsite and delivered. The contractor on the remodel project installed it and applied the finish. 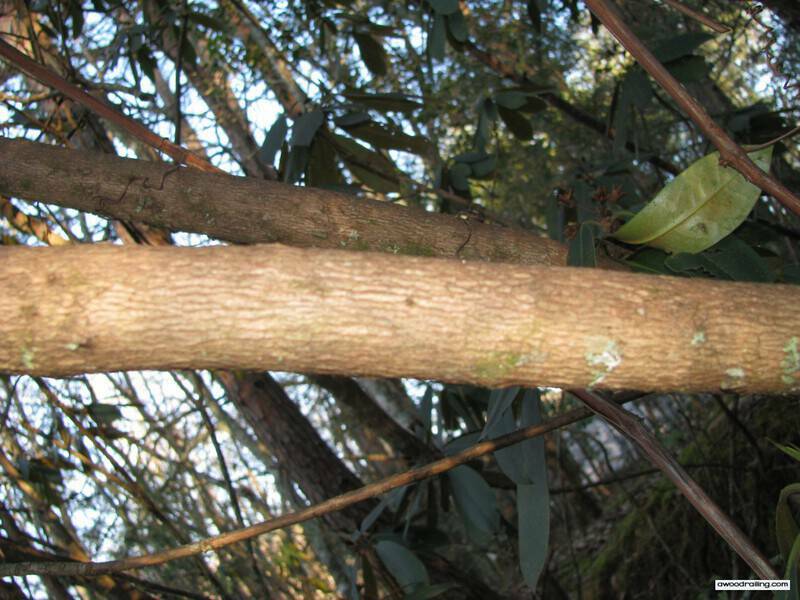 The top rustic banister rail is a stick of mountain laurel as are all the branches. The lower 1×4 boards are yellow pine to match the existing stair stringer, posts, and trim. At the top of the stairs, a slightly different design is used. The top and bottom boards are cedar 2x4s laid on the flat. These boards are mortised into round cedar posts. These posts are almost identical to the tree since they are not milled or cut with a saw. The carpenter here removed the bark before installing and then applies a finish after the work is complete. This style with the 2x4s flat is great for interior railing but is not recommended as a deck railing. The flat boards allow water to collect and this is avoided by using the typical design shown in the product guide (PDF) for all exterior railing. Whatever the style you have in mind, we can create it together, and you’re sure to end up with the best looking rustic railing you’ve seen. These are perfect for log homes and cabins, timber frame homes, and homes with lots of wood accents or a mountain lodge style. Mountain Laurel Handrails are the rustic wood handrails of choice for homeowners looking for a distinctive outdoor style. These railings are made with the top and bottom horizontal rails usually from cedar 2×4 lumber, but the balusters are sticks instead of milled wood. The sticks fastened together in random patterns so that no two are quite alike. Since each stick grows into a different shape, the handrail sections look is determined by the wood used in it. Maybe you would like to learn to build your own? Rustic wood railing enhances the natural beauty of any scenic setting. 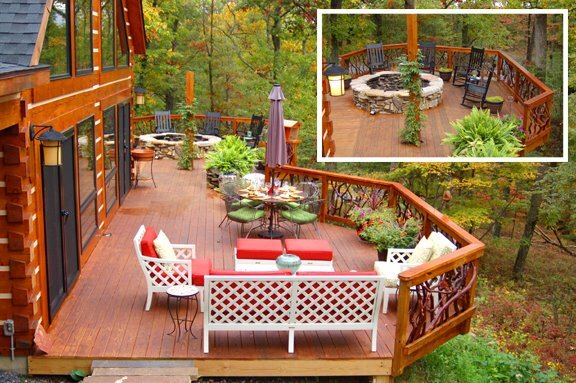 Just take a look at these pictures on a deck overlooking the lake! 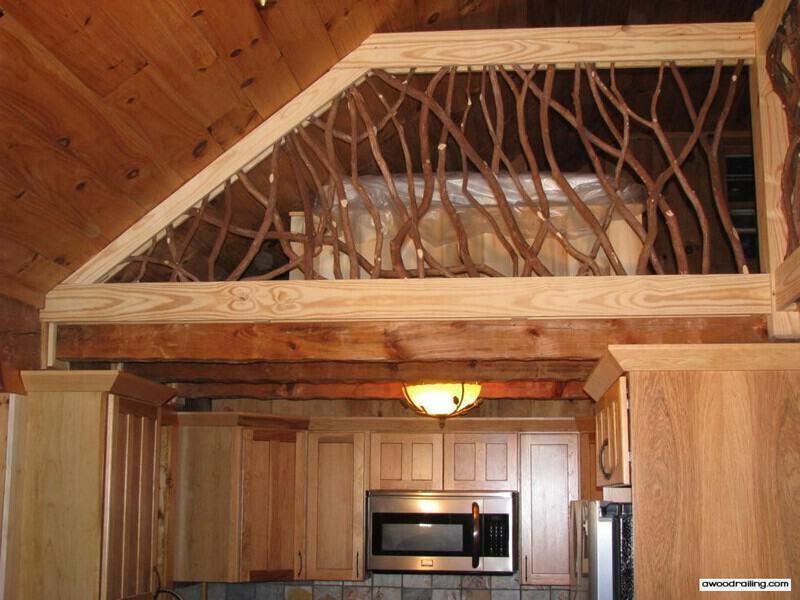 This is a unique railing design where the woven branch sections appear to be picture framed in between each individual post. The empty space on either side is much like the importance of a musical pause; the empty space often is what defines the boundaries of the work. And in this case, the white space lets in more of the natural scenery and accents the fruits of human artisans! 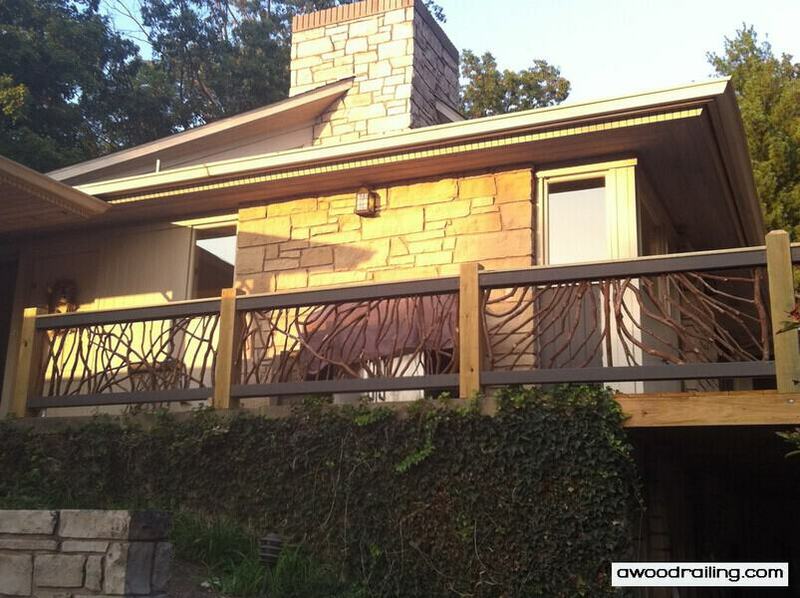 Here’s a picture of a wood deck handrail installed in Ohio. Working closely with the on-site crew enables the Wood Railing team to craft a work of art that will perfectly complement existing conditions. These are framed sections similar to ones we did previously although the railing design is somewhat different. The big timber posts define the boundaries of the frame, and each railing section brings its own organic character. 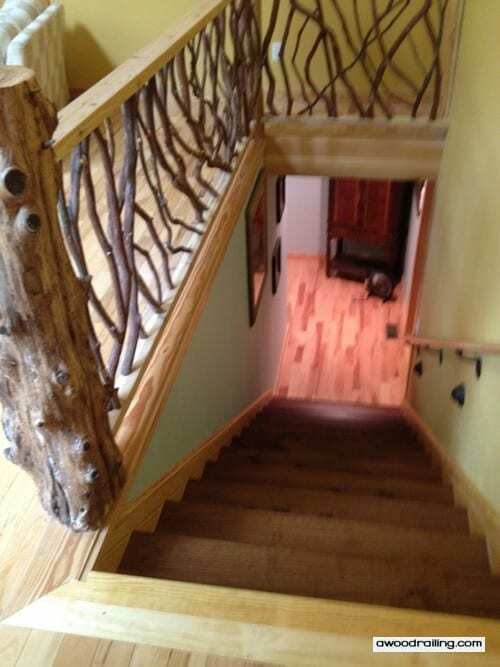 What kind of branches for a rustic railing? Mountain laurel and rhododendron are members of the Heath family, related to roses and azaleas, that thrive in the Appalachian Mountains of Western North Carolina. These trees are often found growing together in dense thickets. In the springtime, rhododendrons bloom with clusters of pink, white and sometimes purple blossoms. Mountain laurel and rhododendron often fall victim to the process of clearing and preparing a home site. These trees are generally burned as waste. 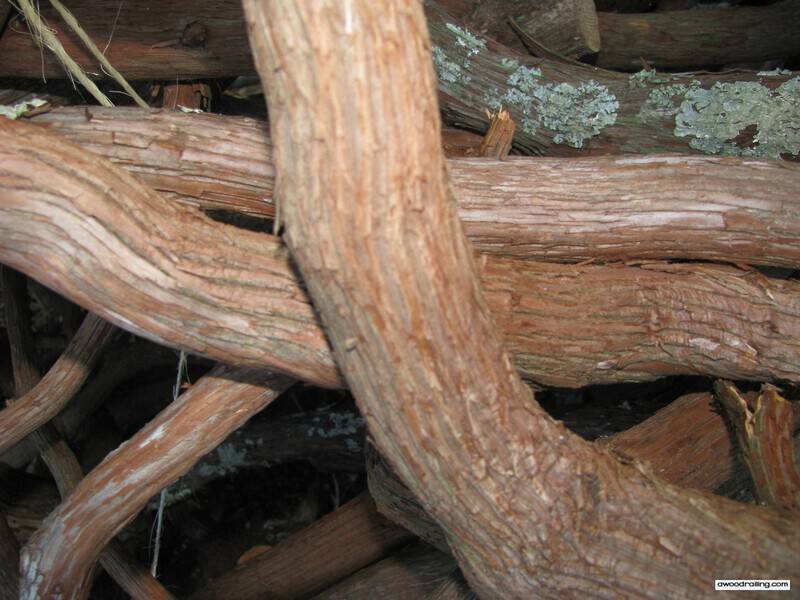 Reuse of these branches prevents them from being wasted in a bonfire and instead brings their organic beauty into your home. 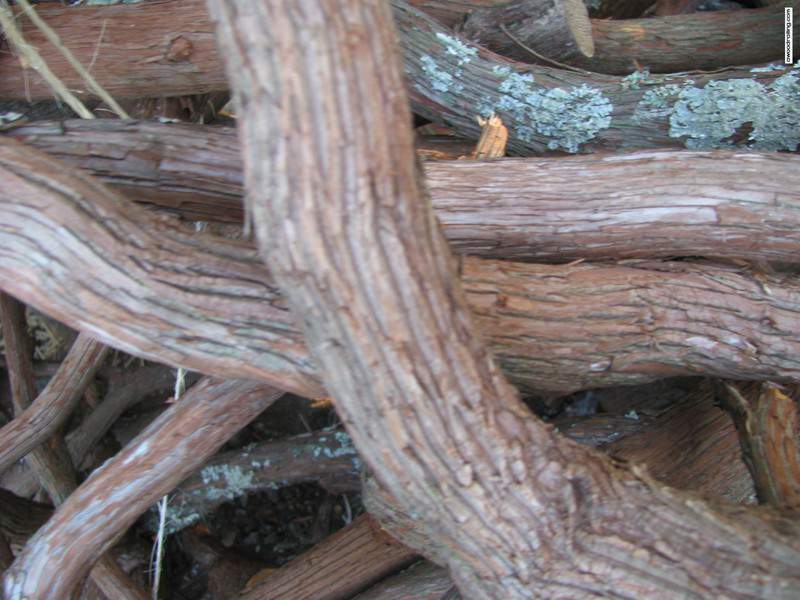 The natural characteristics of these twisted limbs are a perfect complement to a rustic residence. Skilled craftsmen can assemble these branches through complex joinery into dazzling arrangements of nature’s own beauty. The branches of mountain laurel and rhododendron trees are well-suited for use as wood spindles or decorative screen. When used in a handrail, smaller diameter branches of less than 1.5 inches are preferred. The tops and bottoms of the branches are easily ‘sandwiched’ between two pieces of lumber for easy installation. Mountain Laurel Handrails will often look as if they have grown in place. Pre-assembled handrail sections are manufactured to length for delivery to your location. Thicker branches can serve as posts to support the assembly to increase its beauty and complexity. There are also plenty of applications inside the house. 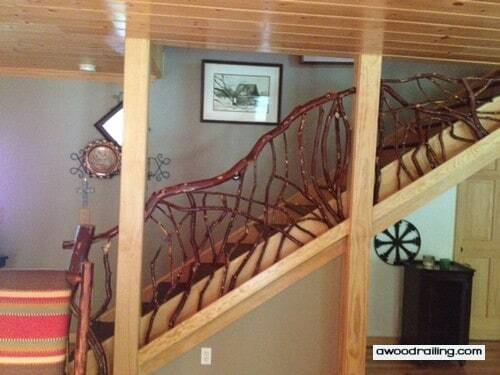 A grand, open staircase in a mountain lodge is stunning with a unique Mountain Laurel Handrail. These handrails also look great on balconies and lofts in log cabin homes. Larger branches can be used in their unaltered state as one-of-a-kind interior accents and decorations. All kinds of furniture, from chairs and tables to bedframes and bureaus, can be crafted out of this versatile wood. Mountain laurel or rhododendron branches bring natural rustic beauty into all facets of your home! Those that are larger in diameter than regularly used in handrails are available for use in other creative projects. Skilled craftsmen assemble this versatile wood into many items including exterior structures, pergolas, gazebos, bridge guardrails and plenty more. An outdoor gazebo could have natural trunks for the walls and roof framing, smaller branches for privacy screens and even furniture in the same style all to impart the look and feel of the forest to your home. Rhododendron is a species of bushy tree that grows in the Appalachian Mountains. This tree grows in a manner similar to, and is also closely related to the mountain laurel. Both are in the family Ericaceae which is a type of tree that prefers more acidic soil. These types of soils are standard on the decaying mountainsides of the Appalachians where a thin layer of extremely rich leaf litter topsoil covers an acidic, clay dirt. Since both of these trees are closely related and grow in similar conditions, they share a general appearance. The branches of both grow into similar sinuous shape and both have glossy, dark green evergreen leaves. In the wild, the flowers are the most striking difference in the spring. Mountain laurel blooms in creamy white and pink bushes while the rhodos are often pink and purple. Rhododendron has been cultivated as a landscaping plant and is now available in many different colors. Rhododendron railings look almost identical to railings made with mountain laurel. 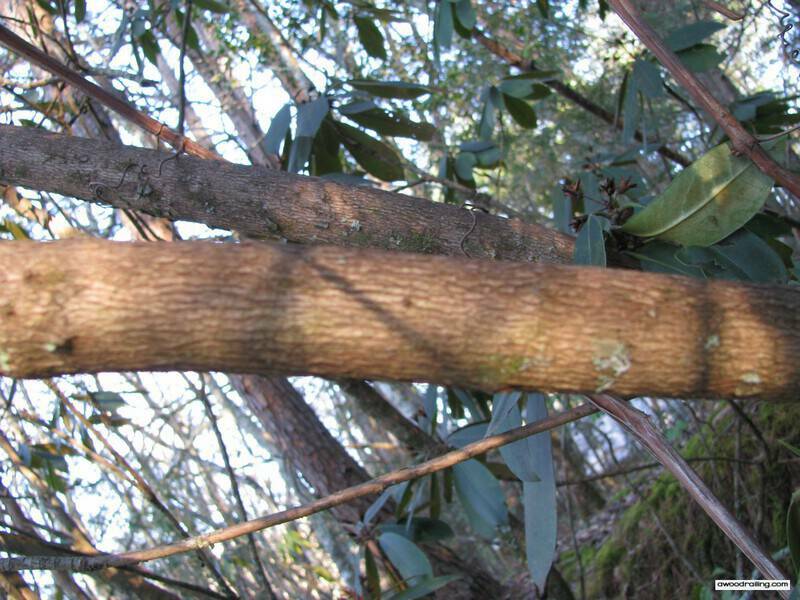 The main difference is the bark of the mountain laurel has lines along the length while the rhododendron branches have a smoother bark with some splotches. – The colors of the inside of the home accentuate or detract from the colors of the furniture and other accessories, ie, tables, lamps, artwork, etc. that you already have. To provide a color contrast more pleasing to the eye, look to the furniture. If your furniture is dark brown or black, it is best to go with a cream or light beige colored non-gloss satin finish paint for your walls. If your furniture is light brown or White, as in White Washed Pine, it is best to go with a slightly darker color on the walls with perhaps a darker accent wall on the side of the room that is perpendicular to the window, maybe a Hunter Green or Brick Red. Look to the rugs as well, the color you choose for an accent wall should be present at least in a small part in the floor rug. Going with a monochromatic color scheme or a Dichromatic color scheme throughout the house is fine as long as you bring color into the house with accessories. – Each room has its own Piece de Resistance, a piece of furniture or artwork that you have that brings the “Eye” to that piece first when you walk into the room. Each other piece in the room should be complimentary, not competitive with that piece. The furniture, rugs, lamps, etc. should all complement each other so that the room has a balanced feel to it. – Your family will spend a lot of time in here. To make your dining room a showplace, think to the table. What color is the wood? You will want a white or cream dining table cloth of linen or cotton, well-pressed. Napkins of linen in seasonal colors with simple carved wood napkin rings go well with silver or gold plate wear, as well as bold colored stoneware plates in Blue, Green, or Red. Navy Blue, Hunter, Olive or Khaki Green, or Brick or Bold Red. The key is simplicity and elegance. – Back in the day, people living in the mountains made their own furniture, clothing, and blankets. The blankets were predominantly either furs or quilts. Nowadays, you don’t have to build your own rustic furniture, that is what you have us for, but keeping a theme in place throughout the house does include the kind of furnishings that a real mountain home would have. Not everyone has four-poster beds anymore, although they are very sturdy as well as beautiful and stand the test of time. We recommend simplicity in furnishings in every room. A simple rustic bedroom has a bed, covered with pure white sheets and pillowcases, a white top sheet, a blanket, and then overlaid by a quilt or an eiderdown comforter in Bold colors, either Red, Blue or Green. If the floor covering is carpet, keep in mind the color of the carpet when choosing the color of the comforter. If the walls of the room are darker, or wallpapered, the bed would look classic and antique covered with a simple quilt. – Your kitchen is an extension of your personality, and tells guests a lot about who you are as a person. Hanging a magnet strip inside the area above the island and then three to five pots and pans from the magnet strip will provide a convenient way for you to get your hands on pots and pans in a hurry as well as an “eye-pleasing” way for you to showcase your beautiful kitchen. Dark cutting boards for light colored kitchens and the opposite for dark colored kitchens. Pot holders and dish clothes that go with the dishes in bold colors that accentuate the other colors in the room rather than competing or clashing colors. – Here is where you can really make your mark and show guests how creative you can be. Bathroom accessories should include a soap dish, hand towels, a box of tissue, and large 6′ bath towels. The hand soap is something you can make yourself. Take a muffin tin, grease it with olive oil and then leave to the side. Take 3-4 cubes of shea butter or goats milk soap ( you can buy them in cakes for $10@ from Michaels Arts and Crafts), cut the cubes from the cake of soap and drip 3-4 drops of essential oil into a coffee mug with a teaspoon of uncooked well sifted oatmeal. Microwave for 65 seconds and then stir with a spoon. Pour into your mold. Repeat steps until your entire muffin tin are filled with soap. Put into refrigerator to harden for one hour. After one hour, pull the muffin tin out of the refrigerator and then put a medium towel on the counter. Put the muffin tin facedown on the towel and lightly tap the back of the tin with a wooden spoon to loosen the soap cakes from inside. Twist the muffin tin sheet to free the soap cakes from the sheet. Now you wrap each soap cake in tissue paper and secure with scotch tape at the back and place two to three cakes of soap in a small basket in each bathroom for family and guests to wash their hands with your homemade oatmeal soap. – For a rustic cabin feel, keep a stoneware bowl of dried flowers on the coffee table along with some coffee table books. Some good books to keep handy are books with photos of nearby attractions and Natural phenomena, i.e., waterfalls, National Parks, Log Cabin homes, and Botanical Gardens. For a small out of pocket investment and a few hours of effort, you can turn your home into a Rustic Masterpiece, simple and elegant. 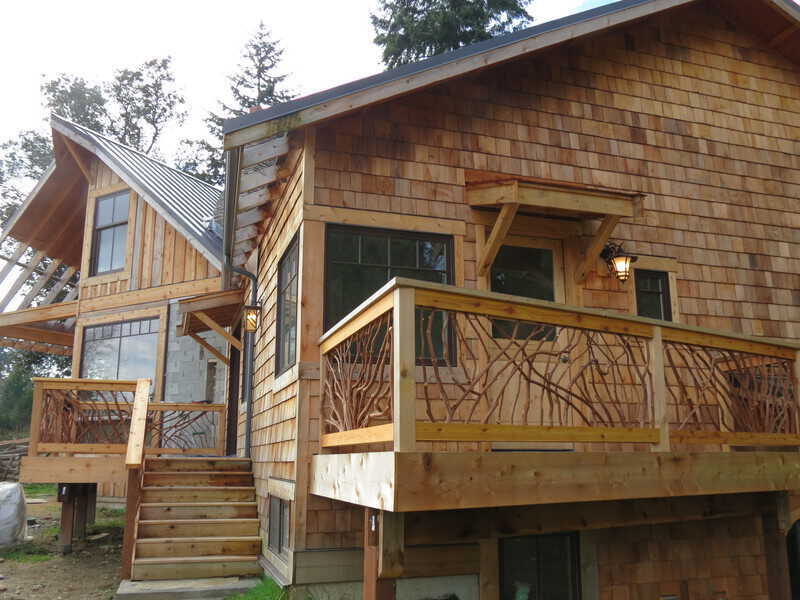 Hopefully, this post has helped you think differently about log home railings and other rustic wood railings you have seen in the past. The right rustic handrails depend on your particular architecture, but not all log railings will be both durable and safe. Good rustic handrails start with naturally durable materials like mountain laurel or cedar.